Only Camp-A-Toaster promises to make perfect toast over your campfire, grill, camp stove, boat stove or even your home gas or electric stove. Two slices of bread to an even, golden brown in a jiffy with Camp-A-Toaster. It toasts very fast; it toasts eight slices in the same time needed for a bulky, conventional four-slice unit to toast just four. It's also used to toast sandwiches, muffins, buns and pastry. It is easy to pack and take with you for tasty toast on the go. 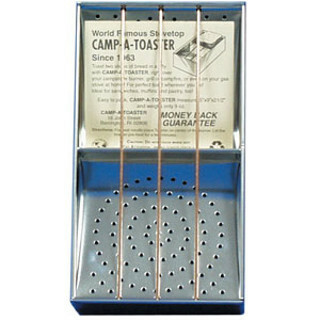 Camp-A-Toaster weighs only 9 oz and measures 5” x 9” x 2 1/2”. Camp-A-Toaster is handy and ideal for cookouts, camping and backyard bar-b-ques.